I realise the title of my recap posts is “what happened in March”…but I am still not quite sure. Only…only 5 days until The Boy Who Steals Houses is hereeeeeee. UGH LOOK AT THIS ATTRACTIVE BOI. ➸ So obviously I’m freaking out with Author !!! nerves !!! here. Everything about The Boy Who Steals Houses has been really really different to the lead up from my debut last year (A Thousand Perfect Notes). ARCs went out later, there are less reviews up, it’s not featured in any book boxes so I don’t have that to promote…etc. etc. I’m so nervous about it doing well?! I need it to. I desperately want to be able to write and sell more books — so it’s like all this ajfdskladj < error > ajfdksladjkl pressure in my head. BUT. I’m also enjoying the anticipation. The messages from people! The excitement! I’ve read some such meaningful and lovely reviews my soul cried happy tears. And I’m just freaking proud of this book, ok? I am. It has my heart and I’m still not fully over being immersed in it. I’m just so so happy it gets to exist in this world. ➸ There’s going to be a UK blog tour! My publishers organised this and I’m so excited for the content that’s going up! I wrote a personal piece on Autism Representation in YA + another piece on all the inspiration behind the book. And remember how I was whining about cutting a cute fluffy scene about potatoes?? WELL GUESS WHAT YOU GET TO READ!!!!! ➸ And reviews? Reviews are so helpful. So if you’ve read it or are going to read it = I’d loooove if you reviewed it! Goodreads, Amazon, retailers, your blog, etc. etc. Of course there’s no pressure. But it’s so so helpful and I would give you, like, half the kingdom if I could. ➸ I also splurged and commissioned fanart. I’M SO EXCITED. I’ve got prints coming, so I’ll reveal it when they arrive but ajfdkslad it is the actual most best thing. ➸ I also blogged about my publishing journey for The Boy Who Steals Houses! ➸ Speaking of blog posts…I’ve done some interviews with amazing bloggers, so please do check them out! 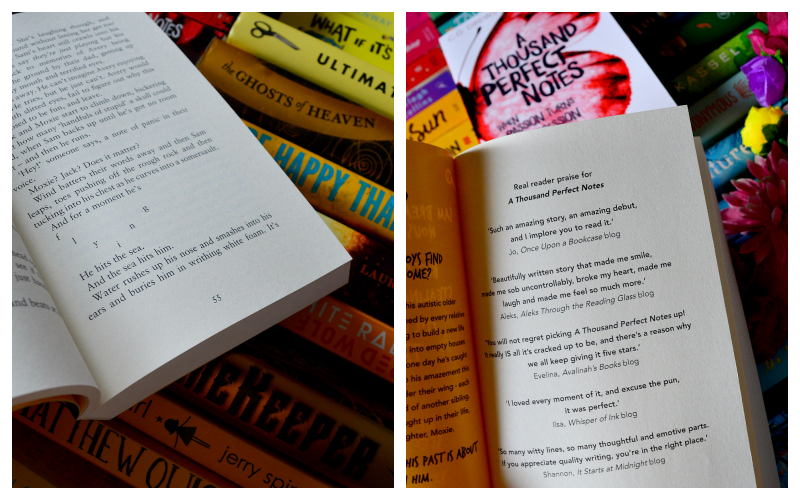 Over on my publishers blog → I list 10 things you need to know about TBWSH before reading! Reading Anyone → I talk about motivation to keep writing and the pressure of blogging vs writing. Everlasting Library → I talk about the importance of writing books about mental illness and disabilities + my favourite book worlds! Chasm of Books → I give querying tips and talk about my author inspirations! Keturah’s Korner → I talk about how I found an agent and landed my book deal + talk about how many buried book drafts I’ve written. Imi Reviews Books → we do an epic back-and-forth discussion style and both chat about writing styles and writing ownvoices autism rep! Uwadis → super excited about this behind-the-scenes interview wtih Thy Bui, my cover designer! There are some early drafts of the cover here too. Thanks to Etinosa for organising this!! Book Dragonism → am chatting to Rain about why I wrote a genderbent Goldilocks retelling + how I handle the ups and downs of publishing. So basically I can retire now omgggggg. ➸ My goals is 18 books per month…but I’m struggling. yes yes I might also be a bit distracted with book releases etc. But I’m constantly behind on ARCs and I feel bad. Also I used to always read 200 books a year with zero problems?! Now I barely know when to possibly fit in writing time, gah. So I’m probably going to cut back. Even by just a book or two. But #DoNotLike this reality check that I’m not superhuman. excuse me while I be ridiculously proud that I actually read a ton of these the MONTH I GOT THEM. 😂 The bar for being proud of me is on the ground. What Reviews Do You Want To See First? REREAD! Still least fave of the trilogy BUT I liked how badass/dark the ending got. Satisfying reread conclusion. I really enjoyed doing a full Grishaverse reread before tackling King of Scars too! I’m still listening to the audio of Crooked Kingdom but hopefully I’ll finish it today or tomorrow. So just imagine it’s here haha. I definitely think Six of Crows/Crooked Kingdom are her masterpieces, but I just looove the world. AND NIKOLAI. Overall it was a good reading month but mostly rereads? And the really only new one I feel completely in love with was Red, White & Royal Blue. ➸ And YAY for April because it’s #AutismAcceptance Month! Yeah we’re skipping the “autism awareness” slogan because (a) that’s from Autism Speaks who are confirmed garbage, and (b) people know about autism, they just don’t accept it. I also saw someone call it Autism Pride month and I’m like 💖✨💕😍🎉 to this title too. Anyway I hope to do some autism posts! I have a collab idea in mind and am gathering some autistic friends to contribute. And I’m gonna give you some book recs too! Also this is like the PERFECT month to read The Boy Who Steals Houses because the main character’s brother is autistic and I love him so. ➸ And because of moving house…I had to rearrange my shelves. Ok here’s the story: I had my main bookshelf in the centre of my floor so I could use both sides. I have a lot of books ok. Now apparently this isn’t conducive to selling a house if you try to walk into my bedroom and you have to squeeze through this narrow gap between shelves. (WHY IS THIS A PROBLEM.) Cue entire room rearrange. But it looks good so I’m happy! And, omg, I had a massive book clean out. We’re talking culling like 140+ books. I donated to the library and the local secondhand stores. It hurt to see them go. But I also didn’t…even…like…those books? Where is the sense, son, where is it. Anyway I like to contemplate my MORTALITY AND SURE DEATH while sleeping below this. I don’t have a bed, ok, I have bookshelves. (Also you can see my A Thousand Perfect Notes Beck/August fanart! And those are edit notes on my wall…for mysterious things.) And yes there’s a shrine for ATPN. As there should be. The rainbow shelf is still here of course! So basically I rearranged everything for photos + selling the house. And in a month I’ll have to pack it all up to do the actual moving-house. So 😂 who’s exhausted already? Meeeee. I left space for my author copies of The Boy Who Steals Houses! And you know the real problem here? I did all this and NO ONE brought me cheesecake as a reward. I live in a fallen world. Now when you think to yourself, “Wow I bet Cait is busy prepping for her book’s release,” you can know I do indeed have 100 things I need to do. I am procrastinating 99 of them by reorganising my shelves. Is it just me or does January last approximately 1000 years? Because I have questions about this, sir. Ugh. I feel like January just goes on and on because we’re depressingly out of Christmas chocolates by now and the weather is quite extreme. I hear the Americans are freezing. I’m DROWNING. It hasn’t stopped raining in two. freaking. months. ➸ my graphic headers for my posts are different! ➸ I’m going to format my wrap-up posts a bit differently too. ➸ I’m back to blogging more! After I was an absolute holey bucket last year…I swear I got nothing done. ➸ There is absolutely a new blog design coming sooooon. HOPEFULLY this should fix my email-subscription-problem too. ➸ Because yes, sob, I’m aware emails don’t get sent out anymore. It’s hella depressing. ➸ Also I deleted an absolute ton of my embarrassing archives looool. It was time. New year clean up! ➸ CUE HYSTERICAL LAUGHING SOBS. do you get emailed my replies to your comments? yes, as far as I remember! Also I read Queen Of Air And Darkness AND The Wicked King….and consequently am d e a d.
They were both absolutely PERFECT and vicious and my emotions are in seventeen pieces !!! these are two of my most favourite authors and they did not disappoint at all. ➸ In case you missed it…my second book, The Boy Who Steals Houses, HAS A COVER! It’s out April 4th! And it is beautiful and I’m so so overwhelmed with happiness on how hyped everyone was to see it! Bookstagram gave my reveal photo all the love in particular (YOU’RE MY FAVE, BOOKSTAGRAM) and twitter got hyped too! It also ranked in the 300s on Book Depository this week (like out of thousands of books, um !!!! omg !!!) and hit some lists for bestselling preorders. I can’t even. You ALL!!!! And I possibly changed my twitter header because I have little to no chill. And if you want to add it on Goodreads or preorder…!!! you know I would love you more than cake!! ➸ I think ARCs will be here in February! I say think because I know less than Jon Snow. But I’m entirely made up of wires and short-circuiting nerves and happiness at the thought of some of you meeting my favourite soft sons early. ➸ I also am writing all the things again. It’s really odd to be, on one hand, like: “HERE IS MY BOOK THAT IS COMING OUT IN EXACTLY 60 DAYS!” but on the other hand, you need to be writing new drafts and doing edits and pitching new books to editors because (on average) it takes a book 2-3 years to go to the shelf. It’s overwhelming and terrifying and my mental health has been Not Great™ and I want to keep being able to publish books so so badly — so there has been a bit of writing paralysis going on. But I have (1) something to edit, (2) something to draft just for fun, and (3) a new project to start soon. And I’m looking forward to it. Going to go type furiously and try to keep my mood as a !!! instead of just a long line of ,,,,,,,,,,, which is my brain just waiting for a miracle to happen and it to start functioning again lolol. ➸ I read 18 books this month! Which is my goal for every month in 2019. My overall goal is 200 books and yES thE mATh is QUESTIONABLE. But I didn’t come here to count, you little onion. Don’t ask these things of me. And I actually haven’t done a book haul post since, um, November. So I have no idea what’s going on. Good news is I’ve read a lot of these already. Bad news is I’M GONNA DIE UNDER MY TBR STILL. Loved the characters! But Asian rep was ambiguous?? Plot/world didn't catch my heart. Graphic novel 101 about autism in women but such a light/fluffy overview it felt inauthentic. i was so confused afsdklafdh I'm sorry. Obscure historical books = you need to give backstory. ➸ I have plots to make a lamington ice cream cake. This is the essence of my existence at this point. ➸ I finally bought a kindle! So I don’t have to scroll on a teeny tiny iPod screen anymore. Look at me GO, doing something functional for myself for once! ➸ And if you’d like to see me talk about any specific aspects of writing / publishing / editing / specifically TBWSH, etc…let me know in the comments! I need post ideas lmao. ➸ Here’s to FEBRUARY! Which is a ridiculously small month that I will still try to fit 31 days of work into 28. LET’S GO!! do your January’s go fast or slow? and what was your BEST vs DISAPPOINTING read of this month?? (hey writers, are you getting hyped for your projects for this year?) and tell me what your favourite social media platforms are? My nerdy little heart is so pleased right now because…it’s time to recap the BEST OF 2018! I love doing these end-of-year posts. The pie charts! The stats! Lines of pretty covers so I can enthusiastically rant about their goodness!! One of my favourite parts of reading is also making lists of books…so in this post, I am THRIVING. I just want to thank you all a monumental amount for supporting A Thousand Perfect Notes! It’s available on Amazon, Book Depository, Waterstones, Barnes & Noble…and in bookstores! (Asking your library to get it in too is awesome. Do that. I love you.) It’s also coming out in Polish, Slovak, Czech, and Romanian sometime next year! Flaaaaail. It’s still this incredible jolt seeing and hearing of someone reading it. My book!!! MY BOOK !!!!! And next year in April you get The Boy Who Steals Houses from me too. While this year has been good and epic…it’s also been tough. My mental health has been pretty much the worse it’s ever been. So despite the awesomeness of a book out in the world, Life Things™ have eaten me up and spat me back out like a mangled refried goat. Depression has been really much this year…sigh. And I’ve definitely been quieter in the blogging community unfortunately. But hey! This year has still been full of good books and I’ve made lovely new friends and I have more bookshelves than common sense in my room. Which is not hard. I have very little common sense. anyway on with the recap! My 2017, 2016 and 2015 recaps are all here! Also this post is LONG…but it makes me happy to look back each year so afjkdslad excuse me. I appreciate how every year Goodreads thinks I’m good at more than just reading, but c’mon Goodreads. Lower your standards of me. Honestly it’s been a weird star rating year for me??? Most of my 5-stars were REreads and my “best of the year” goodreads shelf had half the books of last year. This, um, worries me. It was the YEAR OF THE CONTEMPORARY! Which actually is also because I’ve tumbled into the author world as a contemporary monster master so I need to read plenty. I’ve smoothed all the “fantasy” sub-genres into one — but I read very little epic fantasy this year. MY BRAIN WAS TOO TIRED. Surprise surprise, I am a fiend of the new and shiny young adult books. At some point I may eat more adult books per year? I won’t go wild though. I don’t want indigestion. And I’ve actually read a fair amount of 2019 books already??? WHO AM I. THIS ORGANISED MONGOOSE. I read mostly YA and it definitely continues to be run by smart women which I am very much here for. HOW BIG WERE THE BOOKS I READ? I continue to be successfully tERRIFIED of large books. Around 300 pages is my favourite — not too long and not too short. But I literally read a whopping four books that were over 600 pages lmao. They scare me ok. I am the delicate spin cycle on the washing machine. WHAT FORMAT DID I READ THE MOST OF? I wholly admit I still love physical books > ebooks. But this is also because I read on a tiny iPod screen aaaand THIS YEAR I finally splurged and bought myself a kindle! So hopefully my ebook consumption will go up (because lol lol I have so many eARCs I keep, um…not reading). WHERE DID THE BOOKS COME FROM? That moment when AMERICA DEFINITELY RULES THE BOOK PUBLISHING INDUSTRY. You couldn’t tell I’m Australian from looking at that country chart on the left AJFSHOhsghslHSG. As for book sources ➸ you can definitely see the the majority of my books are GIVEN or BORROWED. Huge reminder you don’t have to have a huge book buying budget to be a blogger!! I still read nearly 50 books that had NO diversity in them…and, mate. This needs to be improved. Also it still pains me a lot how often disability gets left out of the diversity conversation. This isn’t just happening in publishing — the book community barely looks beyond sexuality and race. And I DO NOT want to put those down at all. But we need way way more disability and mental health rep. We need to talk about it. Still there are so so many important and amazing diverse books out there and I’m SO GLAD I got to read so many of them! I’ve read 207 books so it IS HARD to try and mention everything good! I’ll do my best. ALL THE RECS. The King’s Men ➸ ridiculously addictive, sport…and then the MAFIA. Neil/Andrew tho. Seriously how is anyone even aLIVE after all the stupid things these boys do. I don’t even LIKE SPORT AND I LOVE THIS. A Semi-Definitive List of Worse Nightmares ➸ problematic af, mocks mental illness and makes suicide jokes. An Absolutely Remarkable Thing ➸ lmao i just had NO idea what was going on and April May was nasty?? Obsidio (#3) ➸ again, brilliant ending. THE PARACHUTE OK. And Nik/Hanna remain my favourite. Total 5-star trilogy! Smoke and Iron (#4) ➸ ending better have been a typo [SOBBING] but so good! I’m so (not) ready for the finale next year. The Ask And the Answer (#2) ➸ this trilogy is gOLD and brutal and such a journey. I ache for Todd in this one so much. I only finished the trilogy for the first time this year and my opinion, entirely, is yes. Keeper Of The Bees (#2) ➸ ok I absolutely am in love with this one and I did not expect it??? but tragic unwilling antiheroes and mental illness books are my FAVOURITES so !! Bring Me Their Hearts ➸ this was witchy and sassy and just a good ol’ fantasy romp! An Enchantment Of Ravens ➸ ok I only saw negative reviews but I LOVE fey books so…I tried it. And it’s AMAZING. Magical and a little dark. Artists! Swords! A completely endearing stupid immortal prince! And Isobel’s sass gives me life. SO excited for her next book Sorcery of Thorns this year! Boomerang ➸ am utterly crYInG. This one will break you. I immediately bought the author’s toher book, These Gentle Wounds, and will read everything by here tbh. Sadie ➸ this was my first Courtney Summers book?? I MUST READ EVERYTHING BY HER OMG SHE IS BRILLIANT. Fawkes ➸ I will sell my right eyeball for more historical retellings so YES to this one! Also the author is lovely adfjskald and so kind to me in my debut year!! The Wicker King ➸ shh gonna squeeze this one again because WILL DO ANYTHING FOR K. ANCRUM AND HER BOOKS. Lots of rereads here and I am pLEASED. The Falconer (2014) ➸ I’d always vaguely known of this one but I finally read it and WOW AM I IN LOVE. Scottish fairies and stabby heroines. This is my language yes please and thank you. The Iron King (2010) ➸ And I’d meant to read this one for YEARS and finally!! I did!! And it’s totally cliche and a bit trashy (the heroine is the last interesting part ha ha, um, oops) but it was so much fun. Again with the stabby fairy courts!! Every Last Word (2016) ➸ this has brilliant OCD/anxiety rep and ajfdksla I just did not expect to fall so hard for it. Carry The Ocean (2015) ➸ aww this was so wholesome and uplifting while also being really dark at times about mental illness. PERFECT social anxiety + autism rep! The Cruel Prince ➸ Holly Black is a FAVOURITE and she did not disappoint with this backstabby masterpiece. Ace of Shades ➸ I loved Amanda Foody’s Daughter of The Burning City last year!! I Was Born For This ➸ ALICE OSEMAN IS PRECIOUS AND CAN DO NO WRONG. Summer Of Salt ➸ I have yet to meet a Katrina Leno book I didn’t like! The Lady’s Guide To Petticoats and Piracy ➸ not as good as Monty’s (shh sorry) but still epic girl gang and I LOVED it. I adore Mackenzie Lee’s style. Least to say these are all BRILLIANT and 4 or 5 stars! I just…read a lot of contemporaries ok. These are my standouts and I thoroughly recommend them all. Also how incredible are all the diverse contemporaries YA has these days??? RULING THE WORLD. To be truthfully, I didn’t read as much fantasy this year (my brain has been tired gah) but these were pure marvels and delights.